SIL Converters version 4.0 is intended to be installed using the Master setup program found here. 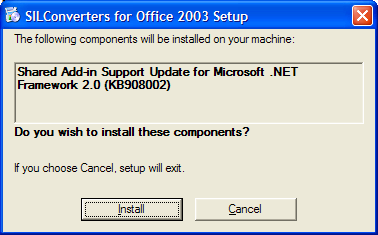 SIL Converters for Office 2003—Currently this installer only installs an additional operating system update needed to work with Office 2003, 2007 and 2010. When you see the SIL Encoding Converters 4.0 has been successfully installed message, click Finish to continue. 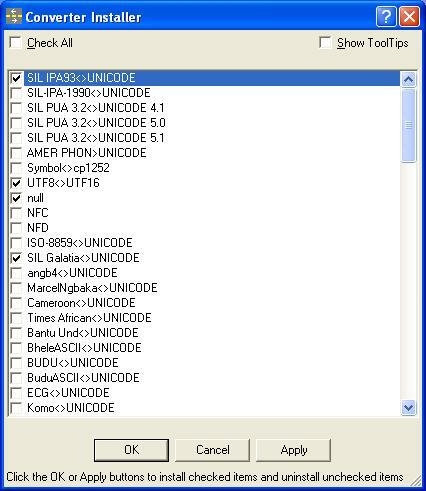 SILConverters 4.0 supports encoding conversions using Python Version 2.5. This means you must have a Python Version 2.5.x. installed on your computer. It will not work with an earlier or later Python version (e.g. 2.4.2 or 2.6.1). 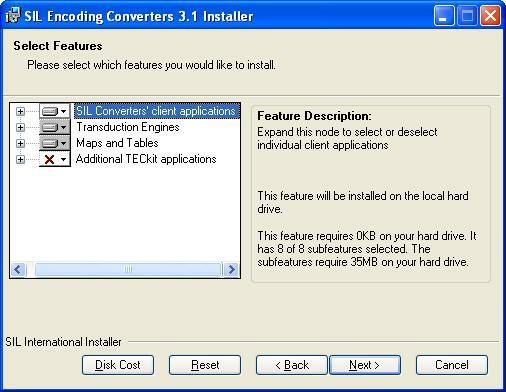 SILConverters 4.0 supports encoding conversions using Perl Version 5.10.1. It will not work with any other Perl version (e.g. 5.8.8 or even 5.10.0). As of this writing, ActiveState Perl Version 5.10.1.1006 is available for download from http://www.activestate.com/activeperl/. It is also possibly available from their previous versions download area http://downloads.activestate.com/ActivePerl/Windows/5.10/. If you are currently using the Perl add-in in SILConverters 3.0 (or FW 5.4.1), which is dependent on the Perl distribution v. 5.10.0, you will need to upgrade your Perl distribution to version 5.10.1 in order to continue using it in SILConverters 4.0 (or FW 6/7.1). If you want to run both version simultaneously (e.g. the Perl add-in from SEC 3.0 (old) together with the Perl add-in from FW 6.0 (new)), you can, but you still need both Perl distributions 5.10.0 and 5.10.1 installed in separate folders (e.g. C:Perl and C:Perl5.10.1). For the former version programs (i.e. SEC 3.0 and FW 5.4.1), you’d use the path to the Perl 5.10.0 distribution and for the newer version programs (i.e. SEC 3.1/4.0 and FW 6.0/7.1), you’d use the path to the Perl 5.10.1 distribution. SILConverters 4.0 may be installed on a Vista Standard User account as long as Administrator credentials are provided in the UAC dialog that will be displayed when you attempt to install. However, there is problem with one of the Microsoft OS update packages not installing properly on Vista Standard User accounts. So, if possible, it's best to try to install SILConverters while logged into an Administrative account. If this is not possible, then at least it is necessary that you manually install the lockbackRegKey.msi installer by double-clicking on it in a Windows Explorer window. If you want to install SILConverters 4.0 while logged into a Standard User account on Vista, then after installation (and before attempting to open any Office 2003 or 2007 documents), you should manually run the following program by double-clicking on it in Windows Explorer: C:Program FilesSILSILConvertersMS KB908002 FixKB908002lockbackRegKey.msi. If you don't do this, then each time you open a Word document, for example, it will attempt to re-launch the SILConverters installer.